There are about 10 buses a day from Agios Nikolaos to Elounda, which is one of Crete’s more upmarket destinations, and most backpackers who visit here are passing through en-route to the famous island Spinalninga. You can find some of the best and most expensive hotels in Crete here in Elounda Beach (one of the best in Europe), Elounda Bay, Elounda De Luxe and Elounda Mare. The guests of these hotels are more often to be found playing in the hotel-owned golf courses than in town. In the centre of Elounda there are some excellent restaurants in the mid- to high-price ranges, may of which serve quality food. The picturesque port, next to the town’s centre has a thriving bar scene, where the party often goes on all night. 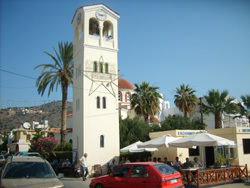 Old Elounda has not been completely swallowed up by development, however, and you can see its church, which has a freestanding clock-tower. Thanks to the bay of Elounda, the sea is calm and flat, making Elounda’s beaches ideal for young families. 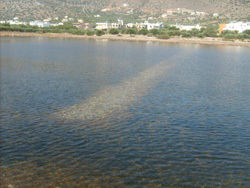 One of the most popular beaches is next to the dam which goes on to the peninsula of Elounda, which has won the Blue Flag award many times over the years. There is an interesting walk from Elounda to the peninsula of Spinalonga (not to be confused with the eponymous island which is to the north of the peninsula). When crossing the dam, you can clearly see the sunken ruins of the ancient city of Olous, which was submerged some 1500 years ago. There are 9 buses a day to and from Agios Nikolaos (about 2 Euro in early 2019, 25 minutes). 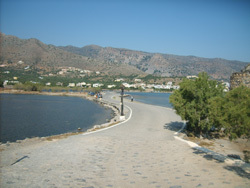 Some go on to Plaka, 5 kilometers north of Elounda. 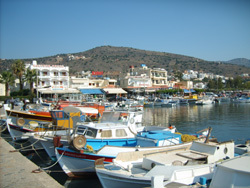 The small bus station in Elounda is in the centre near to the port. 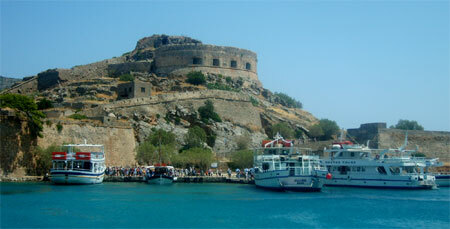 A Venetian castle was built in the 16th century on this island close to Spinalonga. Leprosy was a common disease in Greece in former times, and in 1903 the Greek government passed a law which cast out people afflicted with this disease to islands.